Intel and Micron first unveiled 3D Xpoint technology (pronounced “crosspoint”) in 2015 with the promise of 1000x faster storage and 1000x better endurance than NAND flash used in SSDs. Performance was later reduced to about 7x better IOPS in a prototype, and Intel started to sell the technology under the Optane brand with the 375GB SSD DC P4800X for the enterprise market. 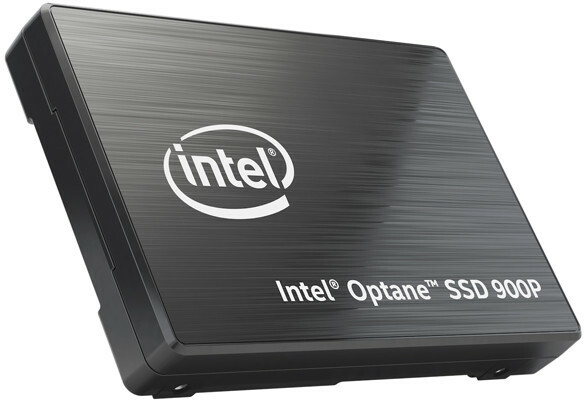 Since then Intel entered the consumer market with 16GB and 32GB Optane M.2 cards which are meant to be used as disk cache in compatible systems thanks to their high random I/O performance, and now the company has announced the first consumer grade 3D Xpoint SSDs for desktops and work stations with Optane 900P Series available in HHHL (CEM3.0) and U.2 15mm form factors, and with random I/O performance up to four times faster than competitive NAND-based SSDs. Both 280 and 480GB models have the same performance and reliability characteristics, except for the endurance ratings, where obviously you can write more data on the large SSD before it wears out. With NAND based SSDs performance often scales with size, but it does not appear to be the case with 3D Xpoint SSDs. 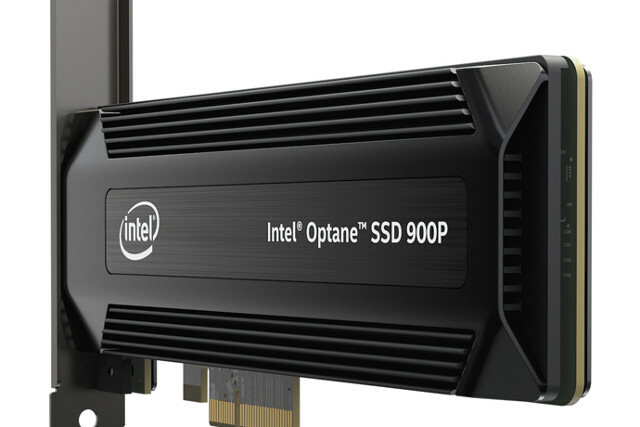 Intel explains the Optane SSD are suitable for “demanding storage workloads, including 3D rendering, complex simulations, fast game load times and more”. Anandtech reviewed the 280GB model, and only recommends it for higher-end desktop computers for tasks where storage is too slow, or RAM is too small, but notes there aren’t that many of them on desktops. While Optane memory (M.2 card) is only supported by some processors & motherboards right now, and the next generation of Intel processors and NUCs will all support Optane memory, except at the lower end of the scale with Gemini Lake processors, the Optane SSD 900P Series SSD should work with any PCIe/NVMe compatible host equipped with PCIe slot or U.2 connector. Optane SSD 900P are pre-sold on Newegg for $389.99 (280GB) and $599.99 (480GB). You may find more details on Intel website. Almost ddr2 400mhz speed in a storage? Omg. My understanding is that this tech is locked to Intel’s platforms only! Buying this you certainly have to plan with Intel systems and in the future, your upgrade path is locked to Intel as well. Such shouldn’t be allowed or supported! DDR RAM has around 10 nanosecond latency. This has 10 microsecond latency, so 1000x slower than RAM for random read/write. No, the above products are not locked to Intel platforms. I don’t know why @cnxsoft mentioned the M.2 Optane standard that acts as some sort of a cache on certain mainboards (and requires ‘a 7th Gen Intel Core processor, an Intel 200 series chipset, an M.2 type 2280-S1-B-M connector on a PCH Remapped PCIe Controller and Lanes in a x2 or x4 configuration with B-M keys that meet NVMe Spec 1.1, System BIOS that supports the Intel Rapid Storage Technology (Intel RST) 15.5 or later driver and Windows 10 64bit or above installed on a supported SATA-based storage device’). But the stuff above is usable with every PCIe/NVMe compatible host. Because I was confused. I had read Optane required specific support in the processor, but actually now I understand the limitation is only for the M.2 memory. It’s the first time I heard about U.2 connectors, it must only be found on high-end computers/servers? There are adapters available from M.2 to U.2 but usually they use another connector type (‘Mini-SAS HD’ AKA SFF-8643) to be combined with the usual SFF-8643-to-8639 cables. But even if it’s key M (the only one allowing for x4) I doubt it’s worth the efforts/money since those Optane thingies should better use PCIe 3 while PCIe host controllers connected to M.2 slots are often just PCIe 2.x. Real DRAM latency is more like 100ns. Windows 10 64bit or above? is there any Windows 10 128bit? or else is there any Windows 11? anyways, I bet you can make it work with Windows 7 without issues. Stop Intel trying to force us to use Windows 10, I know you’re being paid by Microsoft or vice-versa (maybe it’s a mutual agreement, truly disgusting whatever it be, I’m gonna vomit forever). Anyways, I’m with Anandtech, this is just for a very rare case where you need this kind of speed, not for home use whatsoever. Nowadays regular good SATA SSD’s give enough performance for a daily use of any type. Even this is slow when you consider the core of a 3GHZ cpu has 0.3ns cycles., so a DRAM read imposes dozens of cycles of wasted time. Except that normal people don’t care about marketing shenanigans and will just pronoince it “icks-point”.